Ever have one of those days where you just feel like you’re surrounded by idiots? Welcome to the life of Sam “Ace” Rothstein, the meticulous gambler tasked by the Chicago mob with running the Tangiers casino in Las Vegas. Of course, Rothstein is a fictional interpretation of the real-life Frank “Lefty” Rosenthal, but the issues faced by Casino‘s Ace were all too real. Despite the complications of running a Vegas casino, Ace still found the time to be a hell of a dresser, borrowing a sartorial approach from the real-life Lefty Rosenthal to create ensembles like this creative mix of somber charcoal and bold pastel pink. Not even inept cowboys or psychotic gangsters can cramp Ace’s style. 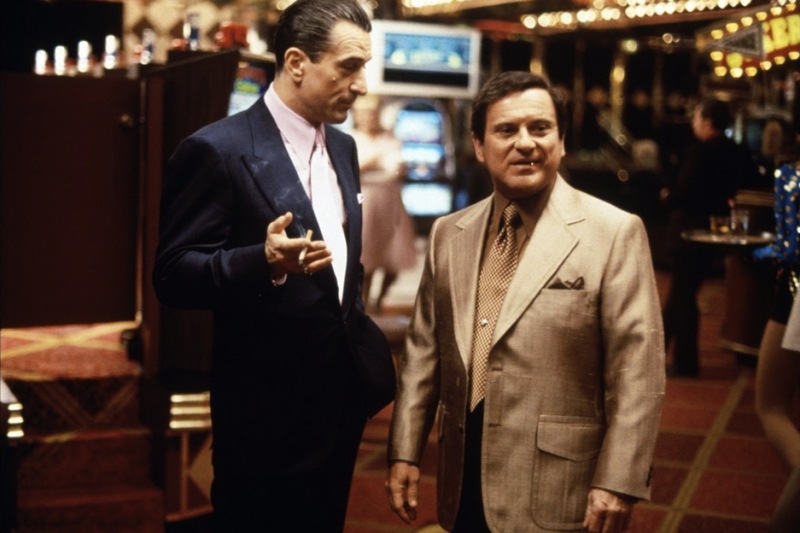 Ace wears a charcoal suit in the same style and from the same material, likely a linen/silk blend, as the dark blue suit he wore when kicking the two cheating gamblers out of his casino earlier in the film. 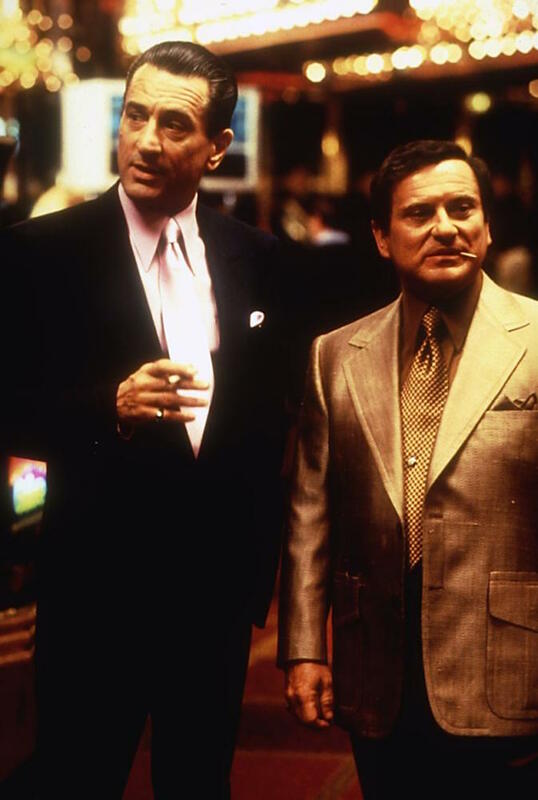 Although it incorporates many elements of ’70s design, Ace’s suit remains relatively timeless while Nicky Santoro (Joe Pesci) looks like a gaudy time capsule with his flashy silk earth tones and bold details like the excessive lapels and inverted box-pleat pockets. As one would expect of a perfectionist like Ace, his suit fits perfectly with the single button of his jacket fastening at the waist line, nicely unifying the jacket to the flat front trousers and preventing the unsightly triangle of shirt or tie material below the buttoned jacket. Beneath that, not much of Ace’s trousers are seen, although it’s reasonable to expect that they have slightly flared bottoms finished with plain hems. The single-breasted jacket has a welted breast pocket, patch pockets on the hips, and a non-functioning single button at the end of each notched cuff. The double vents are appropriately long for the era. The blue cast of the suit under certain light made me wonder if this was the same suit that Ace wore when expelling the gamblers, but production photos and behind-the-scenes footage seem to prove it to be charcoal (or at least charcoal blue). Note details like the edge stitching on the lapels, the decorative single-button cuffs, and the long vents. The jacket’s edge-stitched peak lapels are wide with a full belly and convex break line. The edges of the lapel point to the padded shoulders that work in tandem with the single-button front to give De Niro a flatteringly powerful silhouette. 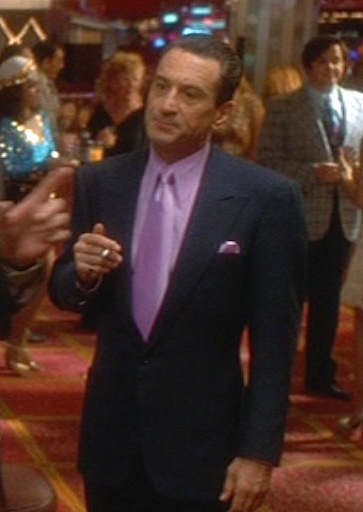 De Niro wears a pink silk display kerchief folded into his breast pocket, puffing out to call out the shirt and tie, all made by Anto for a coordinated match… again indicative of Ace’s methodical nature. Ace has no time for petty squabbles in his casino. All of Ace’s beautifully colorful shirts, ties, and handkerchiefs were made by Anto Beverly Hills, the same shirtmaker that created Lefty Rosenthal’s original bespoke shirts. In this scene, Ace wears a pink soft silk shirt with a matching pink tie made from the shiny satin side of the charmeuse fabric. The shirt has the same “1977” point collar as his other shirts in addition to a monogrammed breast pocket and “Lapidus” single-button tab cuffs. Based on these features, it likely has a plain front and epaulettes that remain unseen as Ace never removes his jacket or tie during the scene nor does he appear to wear the shirt elsewhere. Ace puts Nicky in his place…as carefully as he can. Ace’s jewelry is white gold with blue accents, from the 14-carat ring on his right pinky with an emerald cut aquamarine stone in a geometric polished shank to the 18-carat vintage Bueche Girod wristwatch with its blue square face. One idiot at a time. Ace flashes his ring, watch, and lit Dunhill cigarette while telling Don Ward (Joe Bob Briggs) how it is. Unseen through the sequence are Ace’s shoes, although Ibraheem Youssef’s poster depicts them to be pink to match his shirt, tie, and pocket square. Ace likely wore the black leather raised-heel loafers that he wears with many of his suits and sport jackets, but the pink shoes is inspired and certainly on brand with some of Ace’s louder ensembles. By keeping his color scheme limited to two colors – one muted, one bold – Ace can get away with flashy duds like this pink-on-pink shirt and tie combo and still be taken seriously… very seriously. There are three ways of doing things around here: the right way, the wrong way, and the way that I do it. Hi Nick, to me the suit looks more dark blue to navy then charcoal. It could even be a charcoal blue colour. I very much doubt it’s a very dark grey. But there could be some lighting coming into play as well. I address that in the post. There are some production photos where the suit’s charcoal and gray properties are most clearly evident. The blue-ish cast in certain light looks to be a result of the casino lighting and film processing. That said, I wouldn’t rule out the possibilities of charcoal blue. The best way to know would be to see the garment itself or get input from a member of the Casino costume team. Short of that, we’re SOL. I agree old man, I’d say the best bet is charcoal blue. Still depending of the type of wool charcoal could still be an option. Thanks for the input! I’ll see if I can get confirmation from anyone who’s worked on the film. We all would be happy with confirmation from someone who worked on the film. I can’t wait for some posts on Richard Gere’s great outfits from American Gigolo. I should mention quietly that YTS have a good copy of the film. I’m saying that quietly. Great post and a great outfit. It isn’t just the lighting that can change the colour of the costumes. When they make a print of the film or release it on DVD or for TV they colour grade it. You can change the colours and luminance dramatically in grading. Please Lucky, no more Casino posts. Please?!?! This one is the last one I’d had planned for 2017! It’s hard to resist tossing all of Ace’s pastels into spring posts. I went and visited the Harry Ransom Center last week! The most fascinating thing I learned about the Casino suits is the satin charmeuse was inverted so it would be laying against him on the inside. That is so cool! I’d love to hear more of your insights and things that you learned. That sounds very luxurious indeed.